Since 1980, we have been managing for trophy deer. 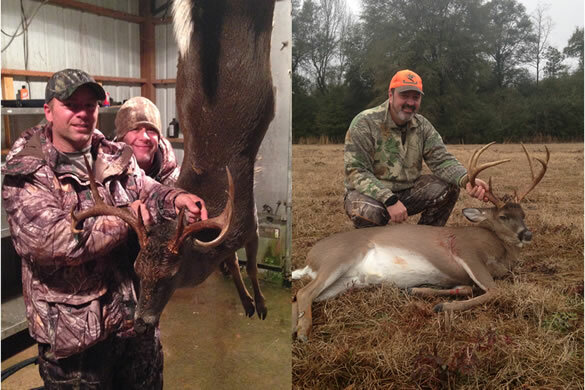 Our philosophy is that to have big rack deer, you can't shoot the small rack ones. Our 4 to 5 year old deer will weigh between 185-230 lbs. and will probably score 130-165 Boone & Crockett. We have found that good nutrition and age combine to produce nice deer. We have good genetics, but without good nutrition, the genetic potential can't be expressed. Everything possible is done to try and make sure that all of the deer's nutritional needs are not only met, but surpassed, throughout the year. We try to take only bucks that are 2 1/2 yrs. old or better. 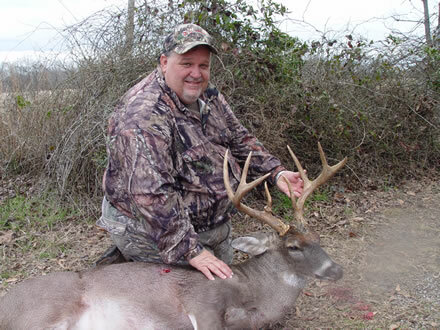 • Hunters are afforded the opportunity to kill one buck (4 on 1 side ) or doe per day. As of 2007, a maximum of 3 bucks can be taken per hunter. • A minimum 3 day hunt will allow you to take only one buck off the restricted area, although, you may kill 2 additional bucks off the remaining area. • A doe and a buck can be taken each day for an additional fee. • Our stands consist of Strong-built tripods, single or double ladders, and fully or semi enclosed shooting houses manufactured by Big Oak or Deer Towers Inc. We also have ground blinds for hunters that can't or just don't want to climb. • These stands are comfortable, safe, quiet and have padded shooting rails for a solid rest. • All hunting is done from stands, no stalk hunting is allowed. • Before coming, try to be confident making 300 yard shots.